This Technology Spotlight highlights the tangible benefits achieved by early SD-WAN adopters across key use cases and outlines a vision for sustained ROI and value creation from the solution. This paper also looks at the role of Cisco in the strategically important SD-WAN market. 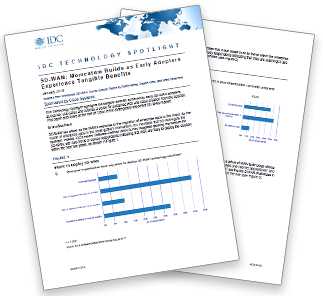 Download this IDC technology brief to learn more about the tangible benefits of early adopters and how to create value and sustained ROI from an SD-WAN solution. © 2019 Logicalis, Inc. All rights reserved.